Yesterday, the news that beloved local artist and entrepreneur, Will TeeZ, was battling Leukemia rocked many in the Uptown community. To say that Will TeeZ is a fixture in the Inwood community, is a massive understatement. Will TeeZ has been an integral part of the Uptown creative community for years now. To meet Will is to like Will. Will get well soon, the entire community is rooting for you. Please see below as Will speaks on his battle with Leukemia and show that man some love! Hey folks it’s WiLL, AKA WiLL TeeZ & I hope y’all are well. I know a lot of you haven’t seen me in a while and have been wondering what’s up. To be honest I’ve spent the last few months dealing with a variety of health issues. At first nothing that seemed too serious but those of you who have seen me recently have probably noticed I wasn’t looking too good and was definitely not my normal self. I spent most of the month of June in the house trying to get better. As an independent artist medical insurance is not something I have so going to the hospital wasn’t my first choice. During the last week of June I went and had bloodwork done in an effort to find out what was going on. When it came back the numbers were alarming and it was recommended that I go to the hospital as soon as possible. On Friday June 29th I entered the ER at Mount Sinai Hospital. After examining me doctors found I was dehydrated, severely anemic, and had a white blood cell count ten times the norm. They mentioned leukemia as a strong possibility. For the next 7 days I received numerous tests, procedures, and a lot of poking in general. It’s been determined that I have AML, otherwise known as acute myeloid leukemia. Basically it is a cancer of the bone marrow that doesn’t allow the marrow to produce white blood cells properly. When the doctors gave me the diagnosis I was shocked and freaked out. I’m only thirty nine years old and it just seemed crazy to be to told “you have cancer”. That was two days ago as of the time I write this. Mine is an aggressive condition and they treat it as such. The treatment is a combination of strong antibiotics and chemotherapy. Believe me to walk in a hospital, be told you have cancer after 5 days and that you will begin chemotherapy in another two is mind blowing. From what I am being told I’ll be in the hospital for at least the next 30 days minimum. During this time I’ll receive aggressive chemotherapy and be under close observation. If all goes well I will only need one round of chemo but, one never knows. Please keep your fingers crossed for me. I have had a lot of support from my family and close friends over the last week and am very grateful. A lot of people have asked what they can do or how they can help. Without insurance the medical costs for my treatment and stay in the hospital are going to be enormous. This is where I reach out to you, my friends, my people, my community. I have support from my family but really have no idea how all the medical costs will be covered. 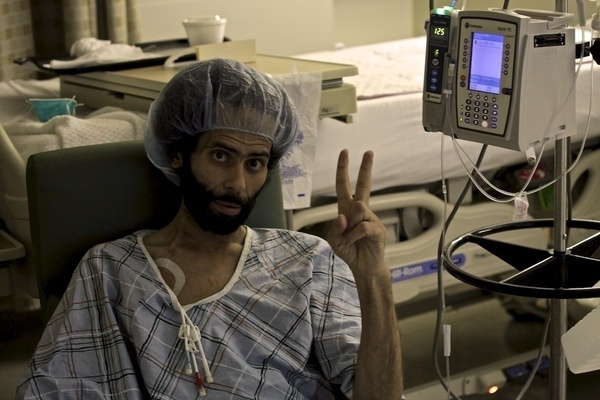 I ask your support to help get me back on my feet and back in the community where I belong. Any donations you can spare will be greatly appreciated. Even a dollar will be accepted with gratitude and bring me one step closer to being able to cover my medical expenses. I try to embody the spirit that if we really are a community then no one should be left alone or allowed to fall. I ask you to hold the same spirit in your heart and help in whatever way you can. Even if you cannot help out financially, spread the word for me please. It all goes a long way and good deeds get repaid in spades. Thanks folks and on my end I’m gonna stay strong and do my best to get healthy so I can get back in the hood and we can continue trying to to make it a better place for everybody. Together.